Back of card: As if from a Grecian urn. Navy-blue ink on a white background. The top & bottom are mirror images, so the cards may be inverted. The mirrored image is of a group of soldiers in battle. Three upright soldiers on the left, one on the ground in the center, one upright on the right, a large shield in the center. There are two words written around the soldiers, but as they are in Greek characters, I cannot read them. Set against a navy-blue background with a tiny, but ornate, border around it all. Booklet included: Yes, a long folded sheet of 14 panes. Each pane measures 2.6 x 4.75 inches, or 66 x 121 mm. Includes brief intros to Greek culture & Greek religion, a conceptual introduction to the Olympus deck, brief notes on each card, and a suggested layout. Comments: This is a deck based on Greek mythology. In the notes on the ancient Greek concept of the Divine, Manfredi Toraldo says, The Greek religion was polytheistic & each god embodied an aspect of nature & the cosmos which, as the civilization became more refined, then evolved into a mental & philosophical concept. 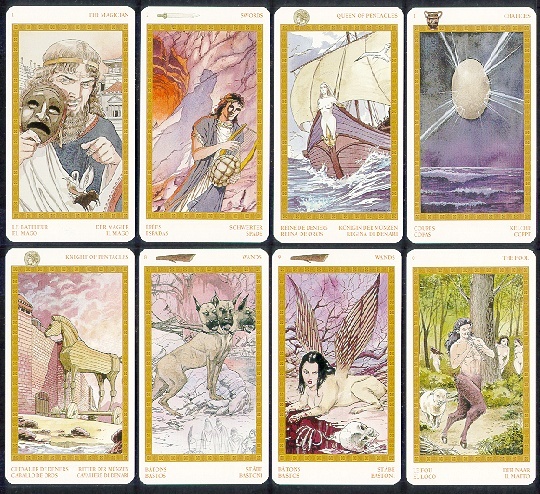 To me, the deck seems to ignore the astrological underpinnings of Greek myth, or perhaps avoids it for other reasons. Here, the Magician is Zeus, aka Jupiter. The Magician in most other decks is Mercury, eg, Hermes. While both can be magical, Zeus is the bigger - and better - of the two. The Fool is Pan. While Pan is a mischievous imp, he is, in his own world, no fool. There are many other interesting alterations of the traditional tarot in this deck. The Pentacles are the objects, possessions, potential & everything material, and therefore the element of the Earth. They were worked out through the symbolism of the objects which were the basis of the legendary feats carried out by the heroes or Greek divinities.... those objects without which the epic events could not have taken place. The Wands represent instinct, the animalistic aspect, passions & strength.... the element of Fire. They are the primordial force present in the human soul which, in the Greek myths, is always alive & represented by the imaginative creatures which crowd the stories. The Swords are logic, intelligence, knowledge, the human mind which overcomes everything, and the element of Air. They were translated, rather, through the image of the human being which, thanks to its ability, overcame the gods themselves or, in any case, arrived where the gods had placed limits: the heroes which represent the strength of human thought against the omnipresent natural forces. The first card is of the Protective Deity, or the situation's positive aspect or virtue. The second card is of the Ancient Deity, or the forgotten energies directed towards the Questioner. The third card, The Card of the Offended Deity, the energies which must be satisfied or avoided in order to obtain a happy outcome. The fourth card, The Card of Fate, indicates the forces outside the will of the Questioner, for good or ill. The fifth card, The Card of Knowledge, are the things the Questioner might learn from his present situation. The sixth card, The Card of Valor, are the personal or external challenges the Questioner must overcome. The seventh & last card, The Card of Guilt, are the wounds or faults the Questioner has generated as a result of his activities. As is generally known, life on earth is divided into twelve great Ages, of about 2000 years each. Up until approximately the birth of Christ, the Greeks lived in the Age of Aries. This was an age ruled by Mars (or Ares), god of war. In this age, the Sun was exalted (eg, got on fairly well), but Venus was in detriment (eg, unable to express herself at all), and Saturn was in fall (eg, generally unhappy). The Aries Age was, therefore, a time of exuberant (Sun) warfare (Mars). What little art there was, was greatly restrained. Or I might say, what little art as has survived, as there was a tendency to smash things to pieces and chop knots to little bits. The Athenian Acropolis is of great beauty, but it was almost unique for its age. In the Piscean age that followed, great beauty would be piled on great beauty, in such unimaginable profusion that even now, nearly a century after Pisces has ended, we still think the world to be a world of art, or that it somehow should be. Why? What were the principle Piscean planets? Jupiter, planet of exuberance, was the ruler. Venus, planet of beauty, was in exaltation. Jupiter, as it were, forced Venus to produce greatness upon greatness. Mercury, planet of intelligence, was in fall. The Piscean Age thought dropping balls off leaning towers to be clever. It thought that looking through funny shaped pieces of glass on dark nights to be intellectually daring. As any art historian will tell you, things changed in the early 20th century. Art stopped being about beauty & became individualistic instead. This was but one of many tell-tale indicators that the Age of Aquarius arrived sometime around 1913. In this age, Saturn, planet of strife, rules. Mercury is exalted, so we are now much more clever than before. We write with Aquarian computers, rather than Piscean quill pens. I fear the Aquarian Age will be clever (Mercury), but mean overall (Saturn). (If not downright inhuman.) The 20th century military esclation may forbode worse times to come. As for art, aside from the inevitable pockets of retro, in the Aquarian Age the magic of beauty has gone. It will not return for thousands of years. This impacts on the ancient Greeks in an interesting fashion. Each successive astrological sign, like each of the 12 notes in the musical scale (a Greek invention, by the way), repudiates the one that came immediately before. Pisces repudiated Aries, which in its turn was repudiated by Aquarius. By contrast, alternative signs are complimentary. Aries compliments Aquarius, Taurus compliments Pisces, etc. In astrology, this is known as a sextile (60 degree) aspect. It is therefore not surprising that after cursory attention in the Piscean Age, the memory of Greek culture has returned in the Aquarian. The Olympics have restarted, there are fraternities & sororities (the "Greeks") on many US college campuses, the "New Age" is awash in Grecian - not Roman - mythology, etc. Make of it what you will.